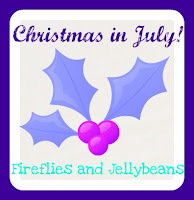 Fireflies and Jellybeans: Christmas in July with How Does She? Welcome to Christmas in July [now in August}! A fun Series to get us all inspired for my favorite holiday! Hello Everyone! We're so excited to be apart of Christmas in July! Never too early to start planning! Just a little bit about us, we are HowDoesShe? We are a site dedicated to finding out "How Does She?" by collaborating ideas on how to become the wives, mothers, and world class women we want to be! We have gathered crafts, recipes, fashion tips, and many other ideas! Check us out! Gift giving at it's finest, from scraps of wood. They turn out awesome! Apply your scrapbook paper onto the wood, using you mod podging skills. When you are done, use sand paper to finish the edges. I use 120 grit sand paper. It goes faster. Mod Podge 3 peices for the body and one for the nose. For the buttons cut out 2 circles, one larger than the other. Use your stain to go around the outside of the circles. Add a real button to the center and glue them together. I just used mod podge to glue them together. It worked. Glue them to your snowman body. Isn't he a cute little guy? Perfect for gift giving or your own Christmas decor! Oh my so stinkin adorable! !